For the album, see I Put a Spell on You (album). "I Put a Spell on You" is a 1956 song written and composed by Jalacy "Screamin' Jay" Hawkins, whose own recording of it was selected as one of the Rock and Roll Hall of Fame's 500 Songs that Shaped Rock and Roll. It was also included in Robert Christgau's "Basic Record Library" of 1950s and 1960s recordings—published in Christgau's Record Guide: Rock Albums of the Seventies (1981)—and ranked No. 313 on Rolling Stone magazine's list of The 500 Greatest Songs of All Time. The selection became a classic cult song covered by a variety of artists and was his greatest commercial success, reportedly surpassing a million copies in sales, even though it failed to make the Billboard pop or R&B charts. 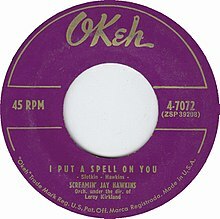 (1956) "I Put a Spell on You"
(1956) "You Made Me Love You"
Hawkins had originally intended to record "I Put a Spell on You" as "a refined love song, a blues ballad". However, the producer (Arnold Maxin) "brought in ribs and chicken and got everybody drunk, and we came out with this weird version ... I don't even remember making the record. Before, I was just a normal blues singer. I was just Jay Hawkins. It all sort of just fell in place. I found out I could do more destroying a song and screaming it to death." Hawkins first recorded "I Put a Spell on You" as a ballad during his stint with Grand Records in late 1955. However, that version was not released at the time (it has since been reissued on Hawkins' UK Rev-Ola CD The Whamee 1953–55). The following year, Hawkins re-recorded the song for Columbia's Okeh Records – the notorious screaming version, which was released in October 1956. However, this version was banned from most radio programming for its outrageous 'cannibalistic' style. A truncated version was later released omitting the grunts and moans from the ending of the song, but the ban generally remained. Despite the ban, the record still sold over a million copies. The hit brought Hawkins together with Cleveland disc jockey Alan Freed who promptly added him to his "Rock and Roll Revue." Up to this time, Hawkins had been a blues performer: emotional, but not wild. Freed suggested a gimmick to capitalize on the "demented" sound of "I Put a Spell on You:" Hawkins wore a long cape, and appeared onstage by rising out of a coffin in the midst of smoke and fog. The act was a sensation, later bolstered by tusks worn in Hawkins' nose, on-stage snakes and fireworks, and a cigarette-smoking skull named "Henry." This theatrical act was one of the first shock rock performances. "I Put a Spell on You" has been covered by other artists extensively; there are several hundred versions available on online stores like iTunes. Most of the covers treat the song seriously; few attempt to duplicate Hawkins' bravura performance. Although Hawkins' own version never charted, several later cover versions have. Nina Simone's version reached No. 23 on the U.S. Billboard R&B chart in 1965; it also reached No. 49 on the UK singles chart that year, and No. 28 when it was reissued in 1969. The version by The Alan Price Set reached No. 9 in the UK in 1966 and No. 80 on the Billboard Hot 100. Creedence Clearwater Revival's version reached No. 58 on the U.S. Hot 100 in 1968. The band later performed it at the Woodstock Festival in 1969. A disco version by Dutch singer Dee Dee (Anna Dekkers) reached No. 16 on the Dutch charts in 1978 and was also released in Belgium (where it peaked on No. 12), France, Germany, Spain, and Australia. In the UK, Bryan Ferry's version reached No. 18 in 1993. The version by Sonique reached No. 36 in 1998 and No. 8 on reissue in 2000. Bonnie Tyler covered this song on her 12th studio album All in One Voice in 1998. Marilyn Manson covered the song on the 1995 EP Smells Like Children. The Crazy World of Arthur Brown covered the track on their 1968 self-titled album. In February 2010 a collaborative version by Chrissie Hynde, Shane MacGowan, Johnny Depp, Nick Cave, Bobby Gillespie, Mick Jones, Glen Matlock, Paloma Faith and Eliza Doolittle was released to raise funds for the Haiti natural disaster. The 2010 version by Jeff Beck featuring Joss Stone was nominated for the Grammy Award for Best Rock Performance by a Duo or Group with Vocal at the 53rd Grammy Awards. Bette Midler covered the song in the film Hocus Pocus in an elaborate song and dance sequence. Midler performed the song again during her 2015 Divine Intervention Tour, wearing a costume similar to the one she wore in Hocus Pocus. Annie Lennox included a version of the song on her 2014 album Nostalgia. Them, featuring Van Morrison, covered the song on the 1966 album Them Again, where it peaked at #138 on the US Billboard charts. The Animals covered it on their 1966 album Animalisms. Smokey Bellows included a version of the song on their 2018 album Devil. A cover of the Annie Lennox version, performed by Brigitte Wickens, was used in an episode of the television series Big Mouth (S2E3 "The Shame Wizard"). DJ Premier sampled the song on the track Kick in the Door on The Notorious B.I.G. album Life After Death. ^ "Screamin' Jay Hawkins - I Put A Spell On You The Singles 1954 - 1957". Discogs. ^ Bush, John. Screamin' Jay Hawkins - I Put a Spell on You at AllMusic. Retrieved 7 November 2015. ^ Mike McPadden (1 May 2012). If You Like Metallica ... : Here Are Over 200 Bands, CDs, Movies, and Other Oddities That You Will Love. Backbeat Books. p. 37. ISBN 978-1-4768-1357-8. Retrieved 7 November 2015. ^ Edward M. Komara (2006). Encyclopedia of the Blues: A-J. Routledge. p. 415. Retrieved 2008-12-04. ^ Ed Sikov (1996). Laughing Hysterically: American Screen Comedy of the 1950s. Columbia University Press. p. 17. Retrieved 2008-12-04. ^ a b Whitburn, Joel (2003). Top Pop Singles 1955–2002 (1st ed.). Menomonee Falls, Wisconsin: Record Research Inc. ISBN 0-89820-155-1. ^ a b Whitburn, Joel (1996). Top R&B/Hip-Hop Singles: 1942–2004. Menomonee Falls, Wisconsin: Record Research. ISBN 0-89820-115-2. ^ Dimery, Robert, ed. (2013). 1001 songs you must hear before you die (Rev. and updated ed.). London. p. 81. ISBN 9781844037360. OCLC 855705641. ^ Gillespie, Paula, and Neal Lerner. The Allyn and Bacon Guide to Peer Tutoring. Boston: Allyn, 2000. Print. ^ "Creedence Clearwater Revival Setlist at Woodstock". setlist.fm. ^ Betts, Graham (2004). Complete UK Hit Singles 1952–2004 (1st ed.). London: Collins. ISBN 0-00-717931-6. ^ "Nominees And Winners – GRAMMY.com". National Academy of Recording Arts and Sciences.